Grand Design RV is a privately owned company founded by close friends Don Clark and brothers Ron and Bill Fenech (each having over 25 years of experience in the RV industry). Their careers have been devoted to leading some of the most successful companies in the RV industry, being part of the ownership team that led Keystone RV Company to be the largest travel trailer and fifth wheel company in the world. While proud of their accomplishments at Keystone RV, they recognized as the company grew, it became difficult to stay in touch with the needs of our customers, employees and ultimately the products built. That is why they left in 2011 to pursue their dream and reconnect on a personal level with our customers and dealers. The result of this new venture is Grand Design RV Company. The benefits of company owners spending time in the manufacturing facilities, meeting with customers and driving all major decisions are absolutely magical! The desire is to create customers for life! They intend to do this by providing more features, better designs and unparalleled customer support for your investment. You can rest assured that your Grand Design product has been constructed with pride and care. 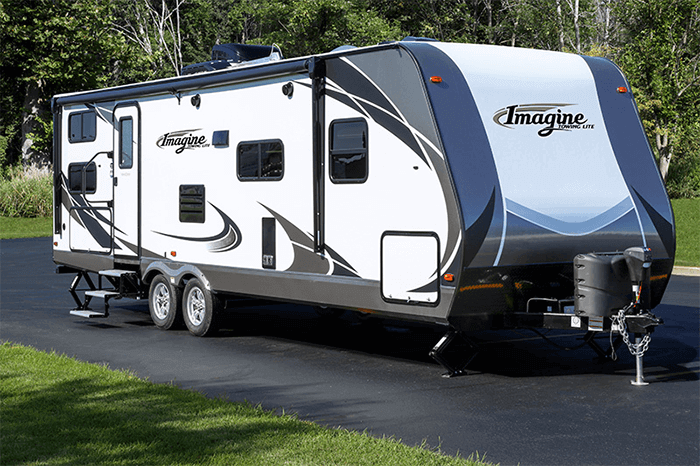 Imagine Lightweight Travel Trailers are the latest introduction of top quality Recreational Vehicles from Grand Design RV. Imagine delivers Best in Class 47cu. ft. Pass Thru Storage and Master Suites with a 60” x 80” Bed and Solid Bedroom Doors, even in the smaller 2150RB slide-out model. With a variety of floorplans, some starting under 6,000-pounds, Imagine travel trailers are a great fit for todays medium sized trucks and some SUV’s. A Celebration of Luxury, Value and Towability. The Reflection Fifth Wheel by Grand Design RV is a combination of high-end style, convenience and legendary Grand Design RV quality into one amazingly affordable package. This kind of no-compromise high-style, quality and luxurious amenities is usually found only in higher priced fifth wheels. Four well designed floor plans give you great choices. The 323BHS offers 4 slide-outs, bunks, outside kitchen and multiple seating options, while the 303RLS, 293RES and 337RLS all have 3 Slide-outs with extra spacious living areas for entertaining or relaxing. Escape, Unwind, Relax, Renew. 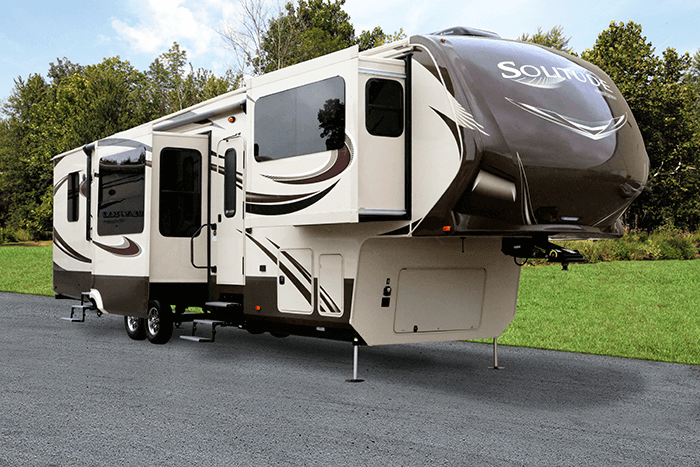 The Solitude by Grand Design is the most spacious Extended Stay Fifth Wheel ever built! Solitude delivers taller ceilings, taller, deeper cabinets, larger scenic window areas, a full 6' 8" tall slide-out, and a body width that measures a full 101 inches! The Weather-Tek package means you get Enclosed Heated Basement and tanks, Heated Utility Center, Upgraded Furnace and Thermal Technology with insulation values of R34 Roof, R30 Floor and R11 walls. All models are also available with Frameless Dual Pane windows. Check out the Solitude floor plans and be amazed at the creativity and smart design. If you like to entertain, the 368RD provides seating for up to 10 and the five slide 379FL feels like home with a separate living room up top. The 369RL and 305RE are a must see as well. You may be looking for an extended stay unit to live in for months at a time… but you just may want to live in this one for the rest of your life! The Momentum Fifth Wheel Toy Hauler by Grand Design is the point where absolute luxury meets mobile garage. They have completely raised the Toy Hauler bar by incorporating an elegant Master Bath and Master Suite with a full walk-in closet but without ignoring the Living and Garage areas. Have a look at the extraordinary space they've created in the 355TH and 385TH. From the 12'2" Garage and Ramp that converts to a Patio, to the Huge Master Bedroom suit - toy haulers no longer have to feel small inside. Some of the other features you'll love are the Optional Frameless Dual Pane Windows, Onan 5.5KW Quiet Generator, External Fuel Station and Level Up 6 Point Auto Levelers. We know you will agree with us when we say that "The Momentum RV is the place to live well and play hard! ".